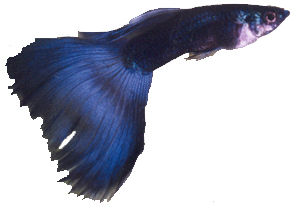 Here you will find the answer to questions readers have asked me about guppies. How soon can guppies breed? Guppies are sexually mature at about 3 months but this maybe less im slightly warmer waters. Male guppies become mature at about 3 weeks old. Well if you female guppy is at the sexually mature age and has been around male guppies then I am almost 100% certain she is pregnant. When will my guppy give birth? Guppies usual give birth at about 28 days but this can range from 21-40 days it all dose depend on you guppies age and size. I recently bought 4 guppies, 2 male and 2 pregnant females. The one female died within a few days but the other one went on and gave birth to 25 fry which was very exciting. They only started to develop some colour after about 4 to 5 weeks – is this correct? Also, they all look exactly the same – just like their mother!! I can’t see anything interesting in any of their tails and the tail shapes and colour are all the same. They are about 3 months old now. Does this mean that I have a whole tank of females or are they still developing? Is this normal? (to have nothing but females). It’ s quite disappointing as they are not particularly attractive! 4 to 5 weeks ­is this correct? A) To be honest this is quite late for their color to be coming through, them usually start to color at about 3-4 weeks old. A) This could be correct, I have had this a few times in my time of keeping guppies and I felt the same way you do. There could be two reasons for this, 1. they cud still be growing....just very slowly OR 2. they are all female because of the temperature of the tank during the females pregnancy, but as you bought her pregnant this could be explained with the transportation of her from the store to your tank. See that the LEFT is the Female with the dark (Gravid Spot) under the back of her belly and the Male on the RIGHT with no such features. Please keep your questions coming in, I'm more than happy to answer them.